On the weekend he's having his first birthday party and it's SPACE themed. If you know me at all, you'll know I love a themed party! So what could I do when my kids were invited to an out of this world shin dig? 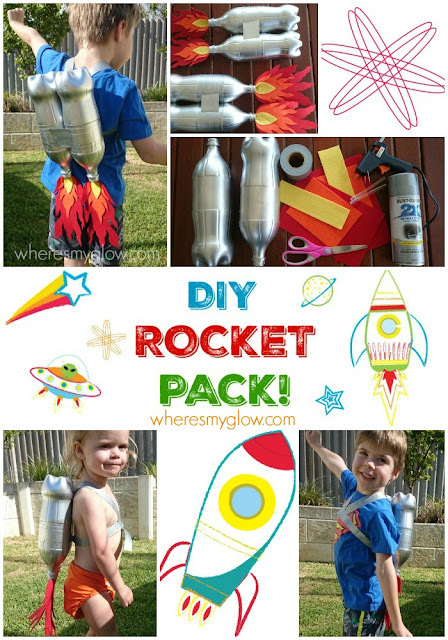 DIY Rocket Packs! BOOYAH! A quick glympse at Pinterest (collating the best bits from a few different styles) and I knocked up these bad boys in an afternoon. 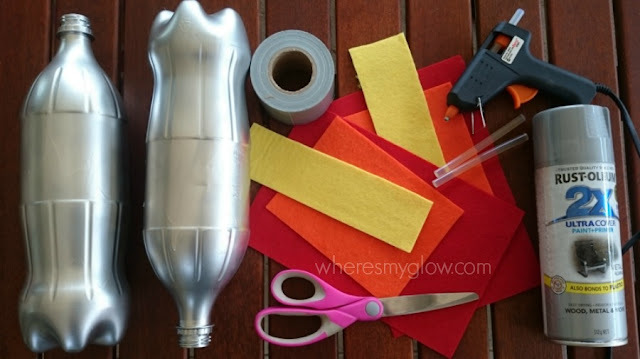 Spray your empty, dry bottles with paint - I put mine on sticks and stuck them in the garden so I could spray the whole thing without touching it. Leave it to dry for as long as the instructions on the paint say... don't take it off early or you'll get silver all over you. 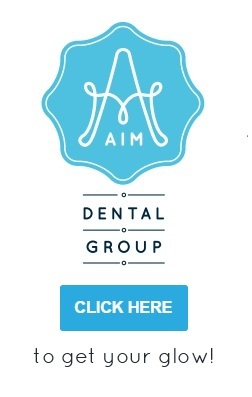 ASK ME HOW I KNOW! While the paint is drying, figure out what shape you want your flames to be and draw a rough outline on the felt with a marker. Leave a tab at the end so that you can easily glue it to the bottom of the rocket later. Cut out the first shape and use it as a template for the next. Keep going until you have the three layers (or two, up to you!). Using a hot glue gun (and not burning off your fingerprints like I did), glue the layers of flame together. I went right to the tip of each flame because I know my kids would pick them apart if they were loose. When your bottles are dry, tape them together using your gaffa tape. If you can't find silver tape, do this step before you spray them so that you don't have to do it all again. When everything is dry, place more hot glue on the tab and push it in to the neck of the bottle, pressing down firmly until the glue sets. To create straps, pull out two lengths of gaffa tape and fold each in half length ways so that they are now silver strips, and thread them through the gap where you secured the bottles together. If it doesn't fit through, add another piece of tape. 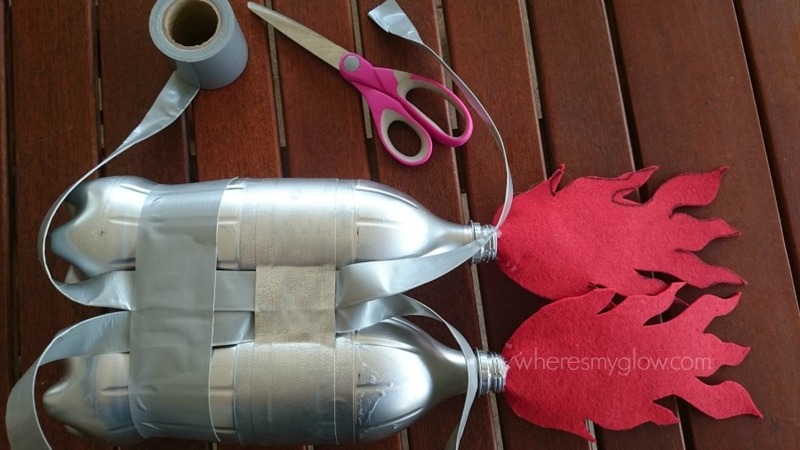 To secure them on to the kids you can either tie the strips together in a knot, or use a small piece of tape to fasten them all together, much like a four point harness. This worked best for my robust lot. It's that easy! And you can sing the Mr Maker theme song the whole time like I did, if you want! 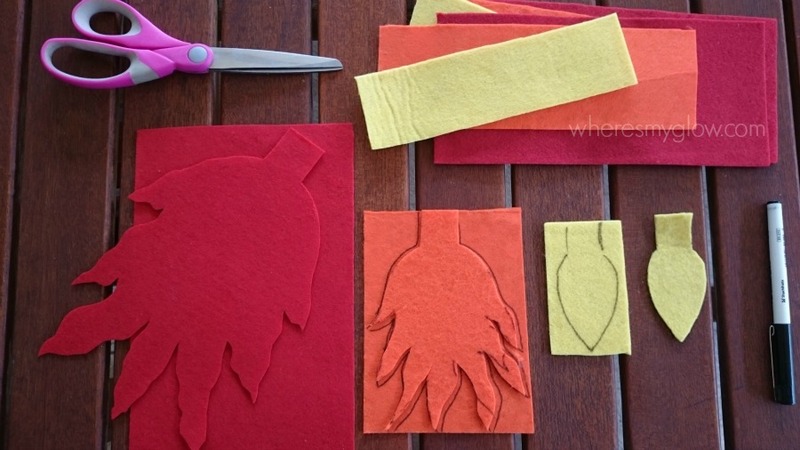 If you can't be bothered with all the felt and burning of fingers, then you could easily substitute crepe paper, or even draw a flame on cardboard and let your kids colour it in. My two zoomed around the yard and went for giant space walks (on the trampoline) for about an hour before I pulled the plug and said they had to keep them in one piece so we could wear them to the party! 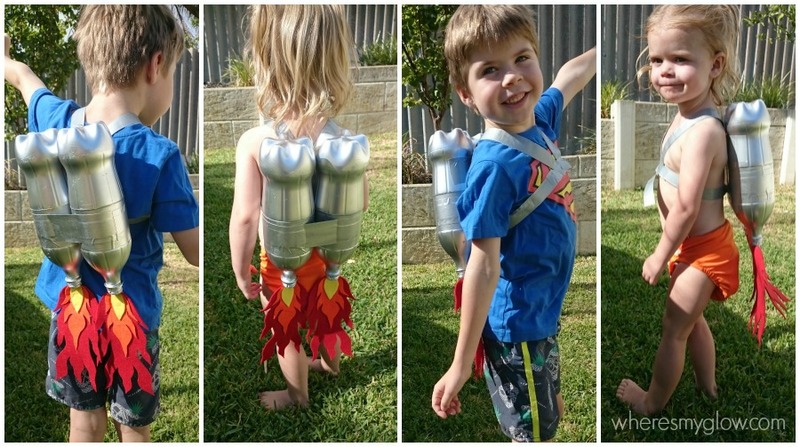 At which point they cried and I yelled, and it was bath time and OMG don't be so ungrateful I just made you a kickass jet pack. Kids, hey?